Bloomsday Bathe on the Beach. | Roger Cummiskey - ArtRoger. Bloomsday Bathe on the Beach. 2017 is the seventh year that this popular event will be taking place. Bloomsday, Friday 16 June 2017 at 08:00 h.
We will start by reading Chapter six from Ulysses – Hades, Glasnevin cemetery in YOUR language. Bring your own copy. We would like you to read in your own language. Enquiries from +34 666 78 26 42. WhatsApp. 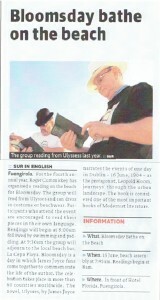 7th Annual Bloomsday Bathe on the Beach. Dust down your copies of Ulysses. We will be on the beach at 08:00 h on 16.06.2017. 2016 Bloomsday Festival at Mr RoHs. The Swimmers and The Readers 2011. Documentary film: A Stroll through Ulysses. 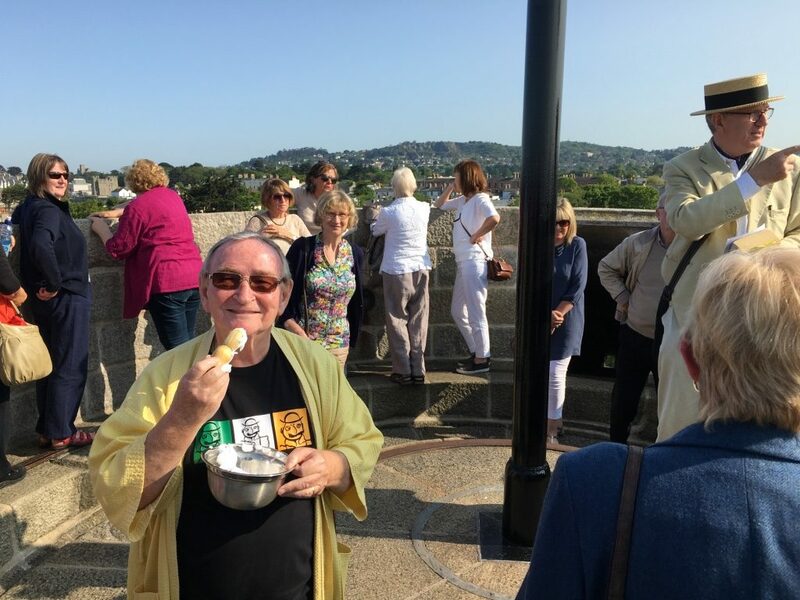 Top of the James Joyce Martello Tower Museum, shaving as Buck Mulligan. Sur in English 20/06/2014. Go to Page 22. 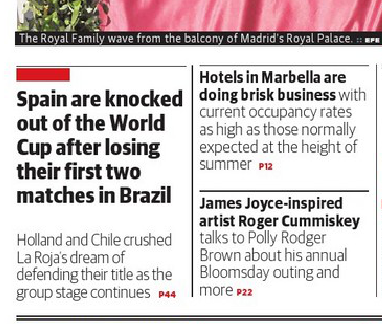 Unsolicited “puff ” from The Irish Times Saturday 14.06.2014. Look on irishtimes.com and go to “News” and ‘galleries‘ and ‘what we like: bloomsday‘, you will see it. 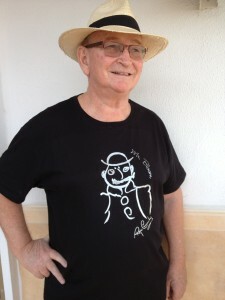 Tee shirt design by Roger Cummiskey with Mr Bloom logo. T with the character of James Joyce novel Ulysses, Mr. Bloom, print on chest with metallic gray vinyl. Short Sleeve 100% Cotton, single jersey, 150 g / m 2 . Double Neck round and made of tubular tissue. Also available for women and children . 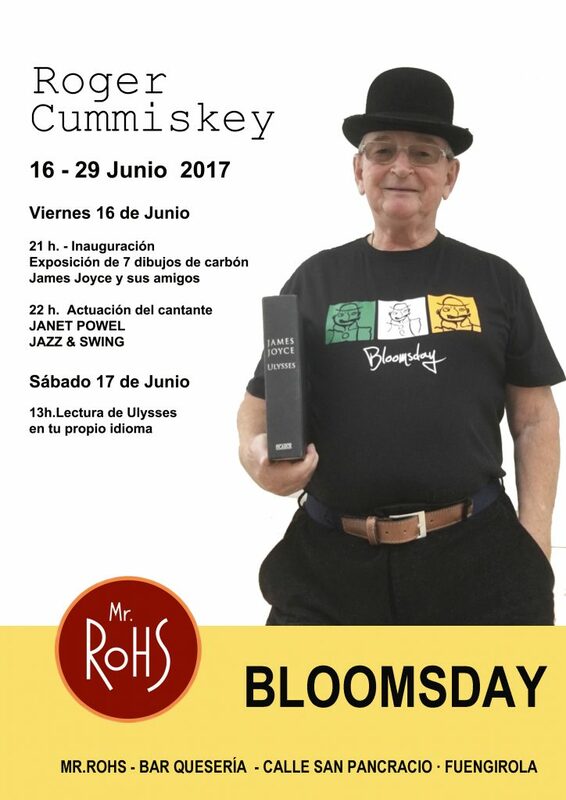 4th Bloomsday Bathe on the Beach Malaga – Spain. Photos. For the fourth year we are planning a simple reading, swim or paddle off the beach on Bloomsday this year on Sunday, 15th June. What makes our event a little different is that the readers are encouraged to read their pieces in their own language. This is a fun, non intellectual, nor threatening event. And it is FREE. All that is required is that you turn up on time to participate. It will be a memorable occasion. A fun get together! Wear the flip flops on the beach from 7:45 AM on Sunday next. The sand is reserved and La Cepa Playa has a new sign overhead. If you walk backwards onto the beach you will see the Pyr Hotel to your left, The Florida Hotel (green glass building) in front of you and Hotel Villa de Laredo to your right. 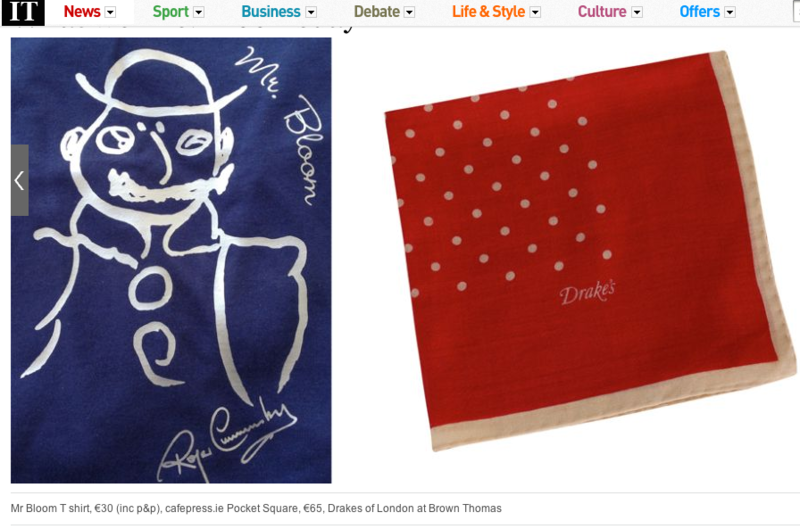 If you then turn around you will see a few Joycean readers flexing their eye muscles. Others just wiping the sleep from their eyes. It may seem a bit early for having fun but then if you have stayed up all night it will be no different than taking a RyanAir red eye flight. Philip will be the guy with the hidden camera. Polly will be doing the investigative journalism. 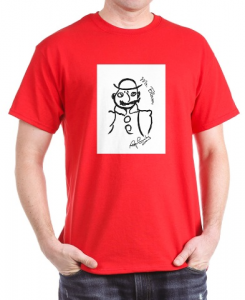 Alfonso will have Tees surreptitiously on his person. Enrique will put all us Whiteys to shame and he does not bother sunbathing. David will have his voice with him if called upon to wake the tourists. Hanne will tend to those weak and infirm from gallivantin´ on both Friday and Saturday nights. Martin will again get into Shakespearian mode and have Rhun to lend a little Thai. Helena may have found her voice. There will be a few experts about in case the Plebs want to know any of the technical details. Welcome new arrivals we surely do not wish to scare them off. If you are afraid of water don´t worry so is everybody else! No memorising the lines of the two chapters. Clive will be on hand to police everybody. Do not bring a pack breakfast as the chiningto will open at 10 and we can all tuck in. Looking forward to seeing you on the beach. Bring an enemy and if you have none then bring your friend. Tee shirts from Cafe Press. And it is FREE. All that is required is that you turn up on time to participate. It will be a memorable occasion. A fun get together providing the opportunity to become fully or partially immersed in – sea water. 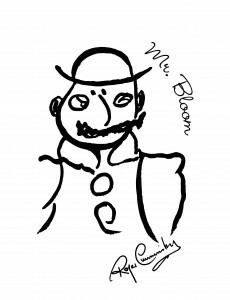 Bloomsday – June 16th – is an annual celebration among Joyce fans throughout the world, from Fuengirola to Melbourne. It is celebrated in at least sixty countries worldwide. The novel, Ulysses, by James Joyce recounts the hour-by-hour events of one day in Dublin – June 16, 1904 – as an ordinary Dubliner, Leopold Bloom, wends his way through the urban landscape, the odyssey of a modern-day Ulysses. Bloomsday Bathe on the Beach, 2014. 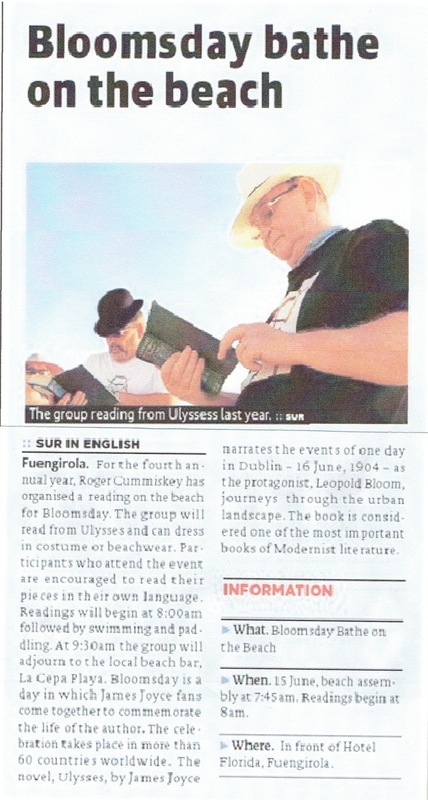 Join us for a little reading from Ulysses and a paddle / swim on Bloomsday 2014. Sunday, 15th June, 2014. On the beach in Fuengirola. 07.45: Beach assembly. In front of the Hotel Florida on the beach La Cepa Playa. 08:00: Readings* by those present followed up by voluntary readings by like-minded male and female participants in their own language wearing varieties of various costumes, hats and beachwear. 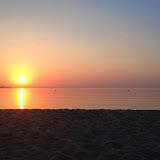 08:45: Divest and dive into “the snot green scrotum tightening sea” – heated by the Spanish summer sunshine. 09:30: Had enough? OK, then lets Swim, Dip or Paddle again before adjourning to the local Chiringito (La Cepa Playa) for toast, olive oil, coffee and chat. * all readings will be c. one page long and this year will be from Chapters 1 and 4. Art Exhibition, Fuengirola. A Stroll through Ulysses. Contact Roger Cummiskey at +666 78 26 42 or artroger@gmail.com. Variety of colours and sizes for men, women and children. 10€ + p&p. 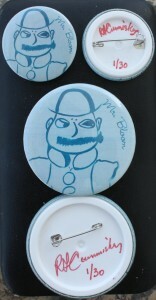 Mr Bloom Tee shirts for Men, Women and Children for Bloomsday. Ladies, Gents and Children sizes. Limited edition of 30. €2.00 + p+p each.